The Drummers are Drumming and Michelle Joyce is marching to the beat! 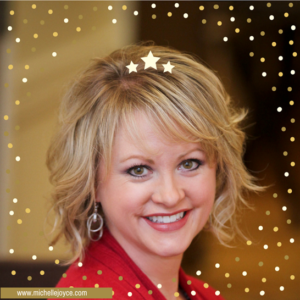 With an unconditional love for the professional speaking industry, Michelle combined her passion of managing and coaching professional speakers to create our company in 2015. She effectively connects audiences and speakers, resulting in a memorable experience every time. Her speaker coaching and consulting programs help individuals create stronger, more attractive brands; develop relevant seminar content and stories; polish their presentation skills; and generate more awareness for their products and services. MICHELLE: In our family, gifts from Santa are always wrapped in white paper with color-coordinated bows for each child. Waking up on Christmas morning to see the new, white packages everywhere is absolutely magical. MICHELLE: We go to church on Christmas Eve and then celebrate with our best friends. MICHELLE: O’ Holy Night brings me to tears every time, without fail. MICHELLE: Quiet, quality time with my family. MICHELLE: My husband and I decided years ago that we would be the couple to host a big, annual Christmas Party. (This year, we hosted our 18th consecutive one!) As part of the celebration, we choose a charity to honor each time. Together with our friends, we collect items that bring joy to others. Some of my favorites include Birthday Blessings, Emile’s Packs of Hope, and The Pajama Program. This year, we collected warm socks for area homeless shelters. MICHELLE: Be present with your friends and family, and spread some Christmas cheer to others!